Reston, Va. — New U.S. Geological Survey (USGS)-led coastal modeling research presents state, federal, and commercial entities with varying storm and sea level-rise scenarios to assist with planning for future infrastructure and mitigation needs along the California coast. 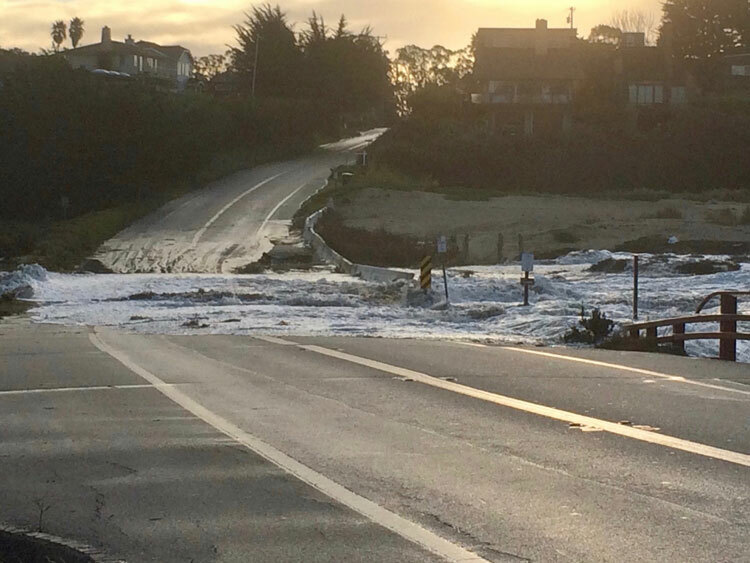 While most vulnerability analyses only look at flooding directly caused by sea level rise, this is the first study to examine a combination of the effects related to a changing climate on the California coast. The study modeled the impacts for a wide range of scenarios with sea-level rise (SLR) increments from 0 m to 2.0 m as well as an extreme 5.0-m sea level rise case. Those SLR values were then combined with four storm scenarios (average daily conditions, annual storm, 20-year storm, 100-year storm). “It’s not just sea-level rise that we need to consider when assessing the impacts of climate change, but it is also the combination of sea-level rise with storms and every daily high tide we experience along the coast,” said USGS research geologist Patrick Barnard, lead author of the paper. The research is being used to help coastal managers prioritize planning and mitigation efforts. These include the National Park Service, Department of Defense, NOAA, Caltrans, California Department of Emergency Services and every major city and county in California. Screen shot of the Hazard Exposure Reporting and Analytics (HERA) website showing southern San Francisco Bay Area flooding and building replacement value impact forecasts with 10 inches (25 centimeters) of sea-level rise plus a storm expected every year. USGS scientists and collaborators used state-of-the-art computer models to determine the coastal flooding and erosion that could result from a range of peer-reviewed, published 21st-century sea-level rise and storm scenarios. The authors then translated those hazards into a range of projected economic and social exposure data to show the lives and dollars that could be at risk from climate change in California during the 21st century. Their analysis focused on highly developed coastal counties in Southern California and the San Francisco Bay area, home to 95 percent of the state’s coastal population. The new paper, “Dynamic flood modeling essential to assess the coastal impacts of climate change,” is available online (https://www.nature.com/articles/s41598-019-40742-z). Researchers from the USGS, Coastal Carolina University, Deltares, the University of Illinois at Chicago, and Point Blue Conservation Science collaborated on this study.